Feed Avalon are hosting a two-day course in how to start your own Plant Nursery. It will be taught by Niels Corfield who has a wealth of experience as a professional nurseryman. Learn more below. 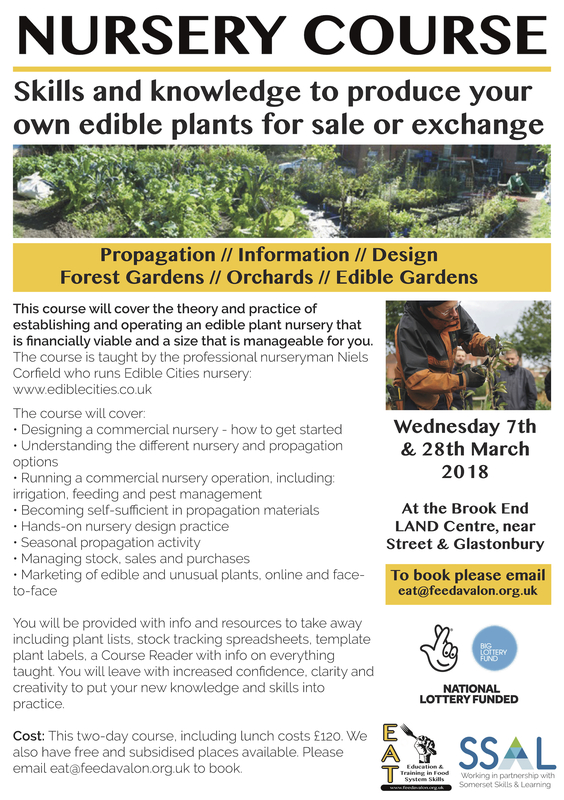 This course will cover the theory and practice of establishing and operating an edible plant nursery that is nancially viable and a size that is manageable for you. You will be provided with info and resources to take away including plant lists, stock tracking spreadsheets, template plant labels, a Course Reader with info on everything taught. You will leave with increased con dence, clarity and creativity to put your new knowledge and skills into practice. Cost: This two-day course, including lunch costs £120. We have free and subsidised places available. Please email eat@feedavalon.org.uk for more information.